As 2018 marks the "Summer of the Snitch," it appears that people have finally had enough of neighborhood busybodies. Snitches are not a new problem—they have been terrorizing communities in America for decades—but this summer it seems like people have finally had enough, and are beginning to fight back. In the past, cop-callers have been able to play the role of the concerned citizen or innocent victim, despite the fact that they were unleashing violent mercenaries on people who are no threat to anyone. In most situations where police are called, a simple conversation will solve the problem without the risk of violent escalation, which is sadly common in police encounters. However, there have been multiple recent incidents across the country that give us some hope that the tables are beginning to turn on the snitches. In these cases, the nosy neighbors didn’t get a pass and a pat on the head, but were instead publicly humiliated and even lost their jobs in some circumstances. Has the American snitch culture finally worn out its welcome? However, much to Barbeque Becky’s dismay, when the police showed up they did not make any arrests or write any citations and allowed the barbeque to continue. Footage of the encounter went viral and instead, Barbeque Becky became the most popular meme on the internet for several weeks. Now, Kenzie Smith, a member of the family who had the police called on them that day, is running for city council in Oakland. Alison Ettel, the CEO of a cannabis company called TreatWell Health, was recently forced to resign from her position after she snitched on an 8-year-old girl who was selling water on the sidewalk. Ettel threatened to report the young girl for selling water without a permit, and thus became known as “Permit Patty.” She claimed that she was only threatening to make the call to scare the girl and that she didn’t actually call the police, but the 911 call was later released to the media. There was a happy ending for the little girl who was selling water, as it was recently reported that a good Samaritan was offering to pay for her to go on a trip to Disneyland. 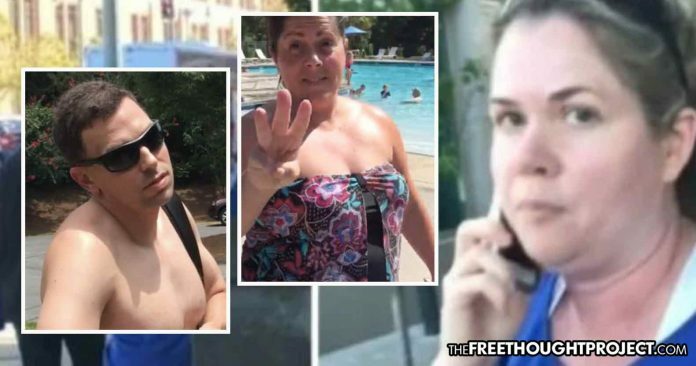 A woman named Stephanie Sebby-Strempel threatened to call the police on a 15-year-old boy who was invited by a friend to swim at a community pool. In the tirade where she threatened the boy, she repeatedly hit him, and it was all captured on video. The video went viral on Facebook, and instead of arresting the boy, the police later showed up at the woman’s house to speak with her, and she ended up getting into an altercation with them and was ultimately arrested after biting one of the officers. A man named Adam Bloom was fired from his job and forced to resign from his post on the homeowners’ association after he called the police on a black family for swimming at a pool in their own neighborhood on the Fourth of July. 12-year-old Reginald Fields, who owns Mr. Reggie’s Lawn Cutting Service, had the police called on him and his friends after they were hired to cut Lucille Holt’s lawn. Holt’s neighbor was reportedly upset that the young boys accidentally cut a portion of her lawn, even though there was no fence or markings separating the two properties. Holt says that the neighbor has called the police on her numerous times since she recently moved into the neighborhood. The young boys have since received nearly $50,000 through Go Fund Me and they were honored by their local church. Reginald is now using the publicity and money from this ordeal to expand his business. Democratic State Representative Janelle Bynum also had the police called on her earlier this month when she was walking door-to-door campaigning in a neighborhood that she represents. The person who called the police ultimately apologized, and the officers were luckily not hostile during the encounter, but if she did not have political power herself, the situation could have ended much differently. As more and more Americans begin to speak out and face public backlash for ‘snitching’ it seems people are finally beginning to learn the value in minding their own business. Now if only they would apply the same logic to prohibition and foreign policy—One can only hope. Another promising takeaway from these encounters is that police have been cautious to not immediately jump to escalation. This is likely not due to a change of heart, but because they understand that they are under a microscope and that at any moment, a concerned resident can shine a camera on them and publicize their actions. Many of these officers are afraid of becoming the next YouTube famous cop, and it seems that for some, it has actually made them less quick to aggression and escalation, especially when there are cameras around.